Fender’s amps are known for their pretty specific tone. The one we are going to look at today brings a decent portion of that tone, only in an extremely compact format. Meet Fender ’57 Mini Twin – a portable work of art that offers a lot of bang for your buck. As a matter of fact, if you need to have a decent guitar tone on the go, there will be only a handful of amps which will do a better job than this Fender. Fender’s ’57 Mini Twin amp comes with a fairly limited selection of controls. However, that is to be expected considering that mobility was the key objective during the design process. Even so, there is some versatility in this tiny Fender box. Controls available come in form of a power, volume and tone knobs. On top of that, you also have a toggle switch that allows you to choose between the clean channel and the built in distortion. The tone control allows for a decent amount of tone shaping considering the size and format of this amplifier.Whether or not it will be enough is going to depend on your expectations. With that said, chances are you will find the tone you are looking for. Fender has done a beautiful job with the aesthetics of the ’57 Mini Twin. The cab is made of actual wood and covered with a soft, quality tweed. However, since looks don’t sell amplifiers, this little box comes with 1 Watt of solid state power. While that is not a lot, you can get a whole bunch of volume from that single Watt. The most interesting thing is the fact that Fender ’57 Mini Twin comes with not one, but two speakers. That’s right, Fender has actually installed two 2 Inch speakers in this small and portable amplifier. When it comes to power options, you are looking at using either a 9V battery or a power adapter. This makes it suitable for both prolonged home use as well as travel use. Most guitar players will agree that performance is always questionable when you are discussing portable practice amps. Being so small, it is fairly unrealistic to expect a whole lot of tone quality. However, Fender actually hit a pretty fine mark with this one. Cleans are fairly decent and reminiscent of their older, proven designs. On the other hand, kicking in that distortion gets you a sweet, gain-saturated growl. The fact that you have two speakers instead one, compensates a fair lot when it comes to thequality of tone you are hearing. Being a 1 Watt amp, Fender ’57 Mini Twin is fairly loud. In fact, you could probably use it for busking and not feel underpowered. What Fender has shown us with Fender ’57 Mini Twin, is that they know how to scale down a good guitar tone. This amp offers just the right combination of features and performance, which makes it attractive to both budget users and those looking for portable solutions. In all honesty, there are better mobile amplifiers out there, but hardly at this price. 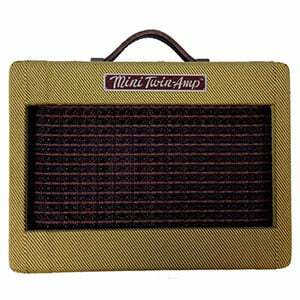 For more info about the Fender ’57 Mini Twin Amp, click here.